There are two ways to look at Sling TV, the new internet-based TV service that will be announced by Dish on Monday at CES: It’s either a poor replacement of what cable has to offer, lacking even basic programming. Or it’s finally a way for cord cutters who don’t want to give up on sports to get ESPN live streaming, plus a few extra stations, for just $20 a month. 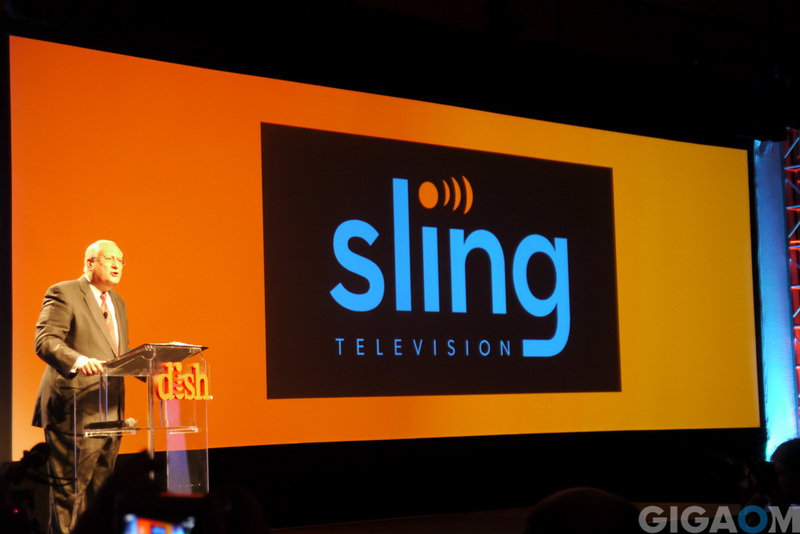 Dish President and CEO Joseph Clayton announced Sling TV at CES Monday. [company]Dish[/company] revealed not only the service’s name but also key details on programming and price: The base package, which will cost consumers $20 a month, includes live access to ESPN and ESPN2, as well as a couple of other cable networks, including Disney Channel, ABC Family, Food Network, HGTV, Travel Channel, TNT, CNN, TBS, Cartoon Network and Adult Swim. Consumers will also be able to add additional packages, including for news programming, family content and sports, for five dollars each. Sling TV will launch before the end of January, and is already in private beta test with select customers. Sling TV will be available over the internet, and consumers will be able to watch the service on the web as well as via Roku, Fire TV, Android TV and Xbox One as well as iOS and Android. Chromecast and Apple TV are notably absent from the list, but Sling TV executives told me during a recent interview that they plan to add additional devices in the near future. Most, but not all channels offer DVR-like pause, rewind and fast forward features. And consumers will be able to access some shows up to three days after they air — but there are once again limits dictated by the contracts that Dish has with TV networks. Dish is not the only company looking to launch an internet-based TV service. Intel tried the same thing with its OnCue service, but eventually gave up on the idea and sold OnCue’s assets to Verizon. Sony announced its own internet-based TV service at CES in Las Vegas a year ago, and began limited tests of the service late last year. But Sony’s approach is very different from Dish’s: The PlayStation maker has been busy signing deals for big bundles, like the one with Viacom that will bring a total of 22 channels to Sony’s TV service, including not only popular networks like Comedy Central but also little-watched properties like VH1 Soul and Palladia. “That type of deal that Sony signed with them is not a deal that we would do,” said Sling TV CEO Roger Lynch during a recent interview. He added that Comedy Central content is already “widely distributed,” with consumers being able to watch shows like the Daily Show on the show’s website or on Hulu. Lynch maintained that the same is true for broadcast networks like Fox or CBS, which Sling TV doesn’t carry. Consumers can access their feeds with an antenna, or catch up on shows on Hulu or elsewhere, he argued, adding: “The fact is that they are already watching it.” Lynch said that Sling TV may add a broadcast tier “over time,” offering consumers to stream content from broadcaster for an extra fee. “We don’t want to force everyone to buy them,” he said. Sling TV bills itself as complementary to Netflix and Hulu. That’s an interesting bet, because it could actually work: Sports has been the deal-breaker for many would-be cord cutters, who just hold on to their $100-a-month cable bill because they don’t want to miss their team’s games. With Sling TV, they may now get what they want for just 20 bucks a month. Plus, the basic tier also comes with access to some content from WatchESPN, the sportscaster’s online video service. Specifically, Sling TV subscribers will have access to the ESPN1, ESPN2 and ESPN3 through the WatchESPN app. 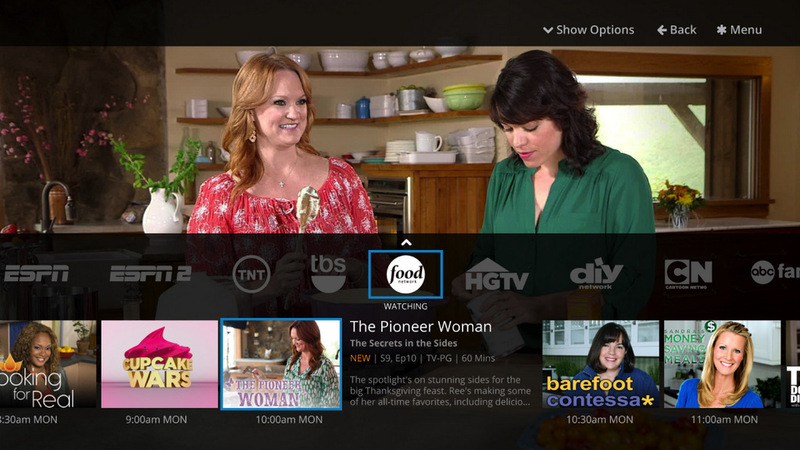 The move towards new online distribution models doesn’t come out of the blue for Dish. The company acquired online video platform provider Move Networks five years ago, and used the Move team to build out its own online team. That team actually launched a first online TV service in early 2013: DishWorld provides expats in the U.S. with access to live TV networks from countries like India, Brazil or Vietnam. Sling TV may sound a little bit like Sling Media, maker of the Slingbox, but the two companies don’t really have anything in common – except the same corporate parent. Lynch told me that it’s been a success for the company, helping to grow the audience for international channels, which were previously only available as part of Dish’s service, threefold. He didn’t reveal any subscriber numbers, but said that consumers who do pay for international TV stations through Dishworld watch over five hours of programming via the service every day on average. Dishworld is currently run by a team of 250 people, and Lynch said that the company plans to staff up in the coming months. “It’s in a way our big beta,” he said. It’s worth noting that this beta test is now over: DishWorld is going to be folded into Sling TV and rebranded as Sling International. Is Dish suddenly a cord cutter’s best friend? Household numbers are growing, while pay TV subscriptions are on the decline. Dish views this as an opportunity for Sling TV. 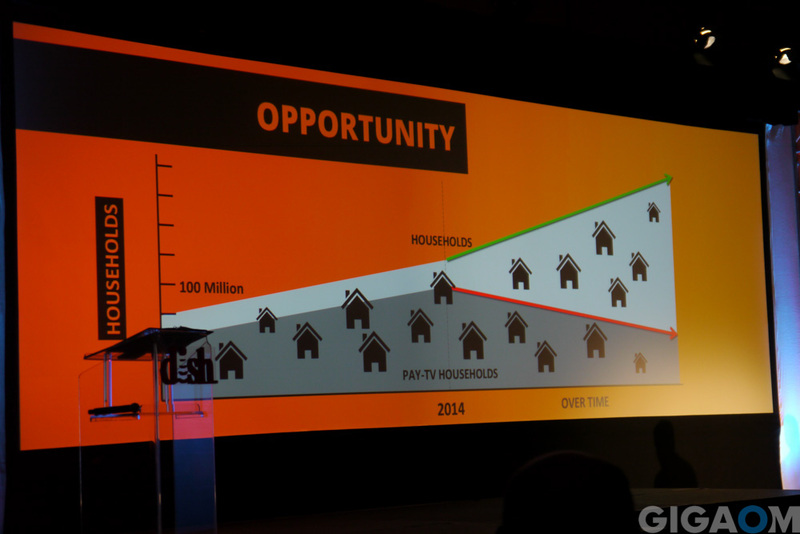 This post was updated throughout at 12:30pm with additional details shared during Dish’s CES press conference. It was updated again at 2:31pm and 4:28pm to clarify how much WatchESPN is part of Sling TV. To me the biggest thing that is not being discussed is the lack of a contract. As I understand it, I can subscribe in September to watch college football, get TBS for the MLB playoffs in October, and cancel in April, after March Madness concludes. Let’s say I do that and pay $160 for the year. That brings the price down to $13.333/month on average on an annualized basis. That, I’m willing to do. $240 for the year for channels I’ll never watch and for four months of ESPN I’ll not watch is something I probably would not do. So the sign up anytime, cancel anytime is a huge plus. I would also prefer to block the channels I don’t want to watch and just show the ones I do want or, alternatively, be able to access ESPN and ESPN2 as an authenticated user through the WatchESPN channel on my Roku and through a TBS channel. If you ISP is a WatchESPN/ESPN3 participating provider, you could have watched most of the bowl games for free on ESPN3, albeit either via the Skycam with no announcers or in Spanish (in which case, I just muted the volume). That worked fine for me. Is it ideal? No. Does it save me $1000/year? Yes. Consider me a cord hater. I recently downgraded my Uverse from top-tier to a basic subscription just so I can keep my local channels. I went from $100 a month to $20 a month (plus HD fee, extra box fees, taxes, etc). I was dismayed during college football bowl season to realize that I lost ESPN also. I hate my cable cord and really wanted Aereo. I will probably support this, even though I am getting used to not having all those channels…. Janko- terrific article. For up to date news about Sling TV, follow us @sling on Twitter. I’ve been waiting for something like this for a long time. And Bud I like fox news as well but they are part of the problem along with other large media companies that have ruined the cable business and turned it into the massive bloated overpriced behemoth. Any company like DISH that takes FOX news off the air will never get my money. They bow down to current Washington administration and censor programs that are conservative because that is what Obama is doing with our country and they are going to help him. Bud, Dish did not take them off the air. Fox pulled their license because Dish did not want to pay what Fox wanted. It is just business and nothing personal. This is nothing about bowing down to Washington. Get Real. Or that Fox “News” wanted 72.7% more in their new license agreement along with DISH carrying more of their opinion channels under a new giant Fox umbrella. As typical with Fox News they have gone everywhere from “Blame Obama” and flat out lying in their commercials about it. It is purely a business move to get you sheepies to call in and complain about them “cancelling” and an attempt to hurt Dish back by getting you to move providers if you were with Dish. Eventually Fox will back down again as happens with every provider, every year as a negotiation for more and more money fails and compromises. “Bud”, that is part of my nickname. It’s all about choices for tv. I would suggest you not use tunnel vision to limit your news content to Fox news only, check out RT NEWS and others for different opinions. I’m sorry but what you are saying is ridiculous. Fox is not on board yet because they are invested in cable tv providers and see the move as a possible economic loss. Wale up man stop assuming everything is a master plan by the democrats. ESPN doesn’t spot the English Premier League so this is still not a viable option for me. Now if they add NBC Sports, I might reconsider. By my estimates, those 12 channels listed above have combined carriage fees of about $11.46 per month. If Dish offered a 25% premium on top of that, they would be $13.75. So it does seem possible to launch this service at $20/month, though it’s hard to say how much profit they’ll wring out of it early on. Biggest question I have: Can I use Sling TV to access WatchESPN and all the content on ESPN3? That would make it a much better value and sort of get around the single-stream and mobile limitations. ESPN 3 is offered by most broadband providers. That is the only ESPN channel I am able to watch at the moment as I only have internet. it is not offered by TW or comcast (unless you have cable tv). If it is $20, i might be in. I’d like the sports and my wife would like the other. That being said, “the other” is pretty much all on youtube, neflix, amazon and/or hulu+. If it ain’t live, it can be watched any time. I guess that I can consider myself a cord-hater. I’m still upset about losing Aereo and will easily champion any other player, especially when it comes to live sports. Agreed, but it uses my $$ to send a message to the death grip of the old guard. If it disrupts the content delivery advantage from my ISP, then that’s great too.